For two years my family and I have been living in a developing country – which is the politically correct term for a third world country. 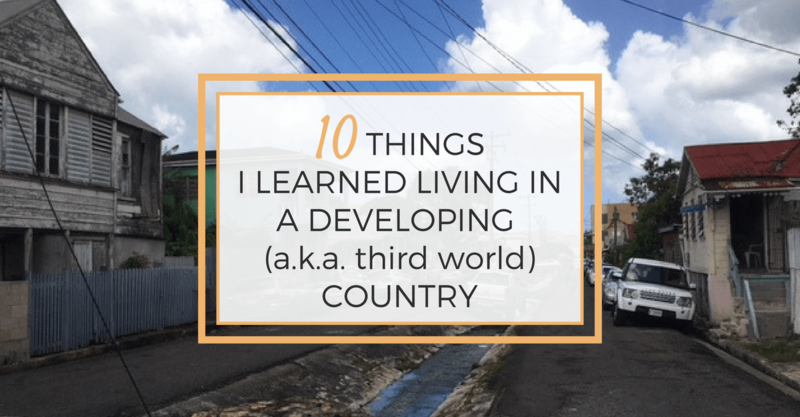 Before we moved here, I had no idea Antigua was a developing country. I mean, I knew not to expect all the comforts of home, but I didn’t realize the extent of the comforts I was used to. Honestly, I didn’t think it would be very different. Everyone said Antigua was expensive, but that you could get everything you needed here. And so, we came. For me, “what I needed here” turned out to be nothing money could buy. Antigua is a beautiful Caribbean island, with stunning beaches and a strong tourism industry. The people are proud and vibrant. I expected to experience new things here, I expected to have to stretch and grow, but I didn’t expect to see firsthand the poverty and struggle to survive that much of the world experiences as normal day to day living. As my time in Antigua draws to a close, I’ve been reflecting on how living in a developing country has taught me so many important lessons and changed who I am and who I want to become. Here are a few thoughts that have been in my heart and mind. Clothes are just clothes. If you have some, and they pretty much fit, that’s enough. They don’t have to match. They don’t have to be stylish or flattering. Just having clothes to wear is enough to be extremely grateful for. Shoes are a bonus, especially if they fit, but even when they don’t. Life goes on without a lot of things that once seemed necessary. Dishwasher, garbage disposal, clothes dryer, Target, Walmart, Amazon. You can get used to life without them and it’s still a really good life. Some things ARE necessary: clean water, good soap, food, shelter. And even then you can survive with intermittent food and without permanent shelter. More people than you might realize live life barely surviving from day to day. I have learned what it feels like to be hated because of the color of my skin. And that kind of hate is ugly and unfounded. Judgment should be based on character, not on skin color. Living with less is freeing. We sold our home and most of our possessions before we came. It was hard, and at times, heartbreaking. But I had no idea how much emotional and mental weight would be lifted by giving away and selling all that stuff. The lightness of having less is worth every sacrifice…times 1000. Most of it we haven’t missed one little bit. Cutting ties with commercialism is challenging, even living on a small island where it’s harder to get stuff. We each brought 3 suitcases when we moved to Antigua and nothing else. The suitcases were filled with clothes, personal and household goods that we would need to live for the next two years. We had family members come to visit 6 times over the two years and each time they brought with them basic supplies that I ordered from Walmart and Amazon. Other than that, we pretty much only bought food and school uniforms here. And I am incredulous at the amount of stuff we have acquired, even in shopping so little. I love the lightness of having less but I still struggle with how to keep the excess of commercialism at bay. As we are packing up, we are trying to go back with only 2 suitcases each. And although I know the freedom of having less is worth any pain felt while purging, it’s still an uphill battle. Packing up our two suitcases each. It must be so hard to be a refugee. I have so much more compassion for them now. Navigating a world that is very different is hard. Trying to learn a new culture, a new money system, a new education system, and sometimes a new language. Doing it without a homeland to one day return to or without any of your familiar possessions would be so much harder. It is difficult being a stranger in a strange place. Never underestimate the power of a friendly face and a helping hand. It just takes one. Many people have played a vital part in our learning to survive here, each of them, individually, in their own way. One person to explain the local customs, one person to accept you as you are, one person to show you how to get to the grocery store, one person to befriend your lonely child, one person to listen as you vent your frustrations, one person to answer your frequent questions, one person to tell you when the government water is on and show you how to fill the cistern. You don’t have to be everything to make a significant difference. You can just be one. Because one is all it takes. God knows best. Trust Him. Take a step forward on the path He is calling you to, even if you think it’s completely crazy and you can’t see the reason. Trust that He knows what you need. It will be exactly the best thing for you. After church on our last Sunday in Antigua, squinting in the sunshine. As we get ready to move back to America, I’m looking forward to enjoying a lot of the comforts we used to. Like using a dishwasher and drinkable water from the tap. But I’m also hoping to hold onto the lessons to help me remember what is truly important and how some things really don’t matter in the grand scheme of things. But above all, I hope I can always remember to use my possessions, knowledge, and talents to bless others, in whatever small way I can, because so many people have so very little. Take a minute or two and reflect on the lessons you’re learning through your current situation. How can you use those lessons to be a blessing to others? Have you ever lived outside the USA or have you ever wanted to? Where did/would you go? What was it like? What things did you learn there? Share in the comments below. Sharing is Caring! Like, Share or Pin this article. Subscribe to the newsletter and never miss a post. The Adventure of a Lifetime: Moving to Mexico. April Stanfield shares the reasons she moved her family to Mexico for a school year and the life-changing lessons she learned from the experience. Five Ways Running Helped Me Transition During an International Move. Rebekah Orton on how a familiar running habit helped her feel comfortable in a life that was so different than she could have ever imagined in Vienna, Austria.